What kind of a movie year has it been? Let’s be guided by the spirit of the season and be generous. Call it a year of small triumphs, which means that no gargantuan movie emerged to dominate the big-screen landscape. That’s not necessarily a bad thing, unless you happen to be a major studio hungering for the imperial clout of a bona fide blockbuster. The year in Colorado? That’s another story. Film commissioner Donald Zuckerman helped land a Quentin Tarantino production — with a boost from a $5 million incentive package. Tarantino began shooting his western, The Hateful Eight, in Telluride this month. No disrespect to Tarantino, but Colorado’s real 2014 triumph involved documentaries. In April, four documentaries with deep Colorado roots made their way to the increasingly important Tribeca Film Festival in New York City: Silenced (about whistleblowers), Keep on Keepin’ On (about the relationship between jazz musician Clark Terry and a young blind pianist), Beyond the Brick: A Lego Brickumentary (about the Lego phenomenon) and a work in progress about endangered species from the same team that made The Cove, a 2009 documentary about the abuse of dolphins in Japanese waters. Keep on Keepin’ On has made the 15-film short list of documentaries eligible for an Oscar nomination. The five finalists will be announced on Jan. 15. And, no, you don’t have to be a jazz lover to receive a feel-good, inspirational boost from a movie that reminds us of the importance of mentorship in developing young talent and of the rewards of friendship at any age. To add to the continued aura of importance surrounding Colorado documentaries, two of Colorado’s Oscar winning documentarians — Denver’s Daniel Junge and Boulder’s Louie Psihoyos — will have films at 2015’s much-watched Sundance Film Festival next month. Both Junge’s Being Evel (about daredevil Evel Knievel) and Psihoyos’s Racing Extinction (the film that showed in rough form at Tribeca) will be in competition for best documentary. A quick reminder: Junge won an Oscar for the 2012 short film Saving Face, and Psihoyos took home Oscar gold for The Cove. The ascension of documentaries aside, most moviegoers still judge the movie year by what’s available at the nation’s multiplexes and art houses. Let me say something about what my 10-best list (see below) isn’t. It isn’t a slam at movies that aren’t on it. 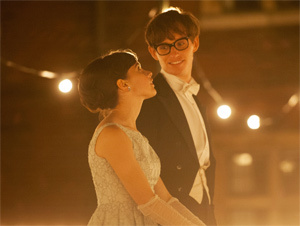 I very much admired the work done by Eddie Redmayne (as Stephen Hawking) and Felicity Jones (as his wife) in The Theory of Everything. Along with just about everyone else, I thought that Benedict Cumberbatch was exceptionally good in The Imitation Game, the story of the gay mathematician who helped crack the German Enigma Code during World War II. I was swept away by the austere, black-and-white imagery of the Polish film Ida, about a nun who learns she’s Jewish before taking her final vows, and I’m still thinking about the performance given by Agata Kuleza, who played Wanda, the nun’s Jewish aunt and a fading Communist big-shot. I wouldn’t say that Get On Up was a great movie, but I can’t believe that Chadwick Boseman, who played James Brown, didn’t get a Golden Globe nomination in the best actor category. Perhaps the Academy of Motion Picture Arts and Sciences will rectify the situation, but I doubt it. It’s difficult for me to think of a movie that had more visceral charge than Whiplash, the story of an aspiring jazz drummer (Miles Teller) tormented by a driven but sadistic teacher (J.K. Simmons). 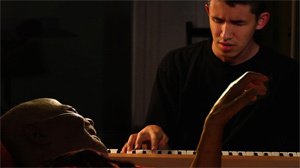 Director Damien Chazelle gave the movie’s musical segments the drive of an action movie. I loved the work done by James Broadbent, Lindsay Duncan and Jeff Goldblum in Le Weekend, a clear-eyed look at love and failure. Mathieu Amalric’s The Blue Room might have been the most adult thriller of the year. Both James Gandolfini and Tom Hardy were fine in The Drop, an underrated adaptation of a Dennis Lehane short story about men and the mob. I’m eager to re-visit Listen Up Philip. This look at the life of an arrogant young novelist featured fine performances by Jason Schwartzman and Jonathan Pryce, as well as strong supporting work from Elisabeth Moss as Schwartzman’s increasingly independent girlfriend. Julianne Moore will break the hearts of those who see her as an Alzheimer’s afflicted college professor in Still Alice. The following two movies are likely to turn up on lots of people’s year-end lists. Not mine. I remain in a minority as far as Birdman is concerned. It failed to make a believer out of me. 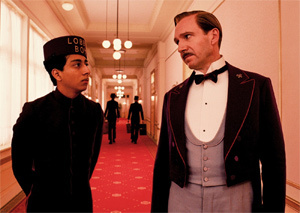 I often have trouble relating to Wes Anderson’s movies, but The Grand Budapest Hotel was a visual treat and deserves praise for the way Anderson embedded wit in the movie’s engaging cascade of images. When it came to big-ticket, mainstream fare, I had decent enough times at Dawn of the Planet of the Apes, Captain America: The Winter Soldier and Edge of Tomorrow. Keep in mind that there’s nothing a critic does that’s more personal than a year-end list, and that not every movie on the list qualifies as perfect. These are the movies that I remember fondly and, in some cases, am still thinking about or (heaven help me) regard as “important” for one reason or another. Director Richard Linklater’s 12-year portrait of contemporary childhood offered the best depiction yet of the fragmented lives that define more and more American families. Linklater focuses on Mason — played by Ellar Coltrane — from ages six to 18. Linklater obtains great work from Coltrane throughout, as well as equally rich contributions from both Patricia Arquette and Ethan Hawke as Mason’s estranged parents. Linklater shot the movie in 39 days over 12 years, employing the same cast throughout. As a result, we watch young people grow and mature until time deposits them — uneasily, I think — on the cusp of adulthood. South Korean director Bong Joon-Ho (The Host) whips up one of the wildest and weirdest movies of the year, a dystopian adventure that turns a speeding train into a metaphor for a class-bound society. 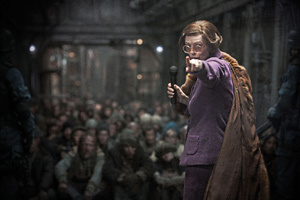 Finally, an action movie with starkly powerful political overtones, a wild sense of humor and an unrecognizable and ferociously funny Tilda Swinton. Alfred Hitchcock made the classic Strangers on a Train. Bong has made a movie that might be called Strangeness on a Train, and moviegoers are better off for it. It’s astonishing that Clint Eastwood — now in his 80s — would even want to direct a movie as sprawling and difficult as American Sniper, a tautly realized war movie that rips its way through Navy SEAL training and winds up in Iraq. There, Chris Kyle becomes the war’s most dangerous sniper with more than 160 kills. The war footage is tense, but Eastwood also explores the impact killing and repeated tours of duty had on Kyle, who suffered from post-traumatic stress disorder. A bulked-up Bradley Cooper — certainly not the actor I would have imagined in this role — gives his strongest performance yet as Kyle. Working from a real story, Eastwood doesn’t lecture us about the horrors of war, but lets us draw our own conclusions about war, SEAL culture and the toll of combat. Belgium’s Dardenne brothers (Jean-Pierre and Luc) are cinema treasures, having given us movies such The Child and Rosetta. Two Days, One Night may not be the brothers’ most powerful movie, but it continues the Dardenne’s unwavering commitment to telling stories about ordinary people. Marion Cotillard plays a woman who has been laid off from her job after her employer asks his employees to vote: Either they all give up bonuses or one of them will lose a job. Desperate and worried, Cotillard’s character asks her fellow employees to reconsider. Once again, the Dardennes have made clear the agonies of people facing difficult situations, crises they did nothing to create. One man alone in a car? Sounds like a formula for cinematic disaster, but Tom Hardy helped make director Steven Knight’s movie into a small treasure by giving us a telling portrait of a British construction manager trying to behave honorably. Hardy’s Ivan Locke takes a drive he doesn’t want to make — from Birmingham to London. He abandons his family and the most important job of his career in an effort to do the right thing by a young woman with whom he had an affair. During the trip, Hardy makes and takes calls from his character’s BMW’s hands-free phone, and Knight and cinematographer Haris Zambarloukos defy the odds by keeping the story visually alive. More to the point: I couldn’t let 2014 pass without acknowledging Locke in a significant way. He’s capable of embodying ferocity and tenderness into a single character, and he’s not likely to win any awards this year. He should. So that’s my story, and I’m sticking to it — at least until I change my mind. Some of the movies on my list won’t be making their way around the nation until January. So stay tuned, and have a happy New Year.